Those of you who have been following What Women Write for awhile know that I'm a huge fan of Cathy Marie Buchanan, whose debut novel, The Day the Falls Stood Still recently came out in paperback. Julie also mentioned the book in a recent post, calling it “mesmerizing.” It is indeed. While savoring both the prose and the historical photos scattered throughout, I ached for Tom and Bess, and heard the thundering crash of a river I’ve never seen but feel I know. A year later I read it again and enjoyed it just as much. Cathy has appeared on many blogs since her book launched and has answered everything imaginable about the novel itself. When she agreed to be interviewed for What Women Write I wanted to ask her something new, questions geared towards process than product. In case you have not seen her other interviews, Cathy answers the most frequently asked questions here. 1915. Niagara Falls. The dawn of the hydroelectric power era. Seventeen-year-old Bess Heath, who has led a sheltered existence as the younger daughter of the director of the Niagara Power Company, meets Tom Cole by chance on a trolley platform, and finds herself inexplicably drawn to him—against her family’s strong objections. Tom is not from their world. Rough-hewn and fearless, he lives off what the river provides and has an uncanny knack for reading the whims of the falls. His daring river rescues render him a local hero and cast him as a threat to the power companies that seek to harness the power of the falls for themselves. As the paths of Bess and Tom become entwined, she must make a painful choice between what she wants and what is best for her family and her future. Kim: Welcome to What Women Write today, Cathy. An element that touched me profoundly in The Day the Falls Stood Still was your theme about spiritual connections between individuals and having complete faith in things you can not see. I often found myself nodding and weeping because you explained the unexplainable. These sections came across as very personal. Was there an inspiration behind Tom’s connection with his grandfather? Cathy: My much-loved father died as I approached the end of the first draft of The Day the Falls Stood Still. The depth of my grief was astounding to me, as was my inability to grasp the concept of mortality. Where was my father? Was he really gone? Why was he gone? Why had he spent seventy-four years on this earth? Was he still with me? Did I need concrete proof? I will not pretend for a moment that I figured any of this out. What did happen, though, was that my grief-ridden struggle with what I believed found expression in The Day the Falls Stood Still. As I wrote, I was seeking for myself the same unshakable connection that Tom had with his long departed grandfather. Kim: I was stunned to learn that you have a degree in biochemistry and an MBA. Most writers I know, myself included, cringe at the idea of anything involving math. What made you turn to writing? Cathy: I’m often asked if I grew up wanting to be a writer, and the answer is a definitive no. I spent my teenage years disgracing myself in high school English, often getting upwards of twenty percent deducted for spelling mistakes on exams. When it came time to head off to university, one of the criteria I used for selecting courses was not having to write—that is, spell—a single thing. I did manage to finish undergrad without writing a single essay! I spent the bulk of my non-writing work life at IBM, at first in finance and then in technical sales. Despite much evidence to the contrary, my creative leanings were evident throughout my teenage years, in both my serious pursuit of classical ballet and my burgeoning abilities as a seamstress. Once I began working, I attempted, I think, to satisfy my creative yearnings by enrolling in string of continuing education courses, always something with an artistic bent. Finally I hit upon creative writing, and right from the very first class, I was smitten. I was home. Kim: Tell us a little about your writing process. Do you do all your research up front, or is it an ongoing venture? Do you outline or make character sketches? Do you whip out a first draft in a few months and then edit, or re-write compulsively as you go? Cathy: Before putting pen to paper, I spent four months researching The Day the Falls Stood Still, a task that was purely pleasurable. Even so, while I was writing, I was constantly turning back to the history books. I did not make an outline and had only the vaguest idea where I was heading with the book. I finished the first draft in a year and a half and then spent the next two and a half (!) rewriting it. I think the degree of rewriting the book required was at least in part due to my lack of an outline. I am working on another work of historical fiction, and, this time around, I spent time plotting the book up front. Fingers crossed that I’ve avoided some of the pitfalls that kept me rewriting for so, so long. Kim: I’ve read you have three children. How do you balance writing and family time? Cathy: While I was writing The Day the Falls Stood Still finding balance was reasonably easy. I wrote while my boys were at school and my husband at work, finishing up at 3:29, in time to run across the park and pick my boys up from school. I rarely wrote on weekends, other than jotting down the odd note when something I wanted to incorporate into the book occurred to me. Now that my book is out there in the wide world, I give readings and talks and interviews. I post on blogs, tweet, update my facebook fan page, and attend book clubs, in person or via skype. I am working on a second book and, out of necessity, have made a rule that I must get four hours of writing under my belt before I can turn to the other million things I should be doing. With much of the publicity happening in the evening, my own reading for pleasure has suffered and my family sometimes gets the short end of the stick. My boys are 12, 14 and 16-years-old now and getting more independent every day. (Sigh.) I think, even two years ago, I could not have managed what I do now in terms of publicity. Kim: I’m struck by how beautifully that landscape becomes a character in itself within many books by Canadian authors – such as Niagara Falls in your novel, or Lake Superior in Jane Urquhart’s The Underpainter, or Newfoundland in Donna Morrissey’s books. Canada has produced some great literature, yet many Americans aren’t familiar with writers from north of the border other than L.M. Montgomery, Margaret Atwood and Alice Munro. Our readers are always up for reading a good book – do you have any recommendations? Cathy: I adore every writer you mentioned. Other Canadian favourites include Elizabeth Hay (A Student of Weather, Late Nights on Air), Carol Shields (The Stone Diaries, Republic of Love), Emma Donoghue (The Sealed Letter, Room) and Helen Humphreys (The Lost Garden, Coventry). Kim: Can you tell us about your involvement with the Friends of Niagara Falls? Cathy: With the arrival of the casinos in Niagara Falls, Ontario came myriad new high-rise hotels, most within a stone’s throw of the falls. The result–an expanse of concrete and glass extending downriver from the Horseshoe Falls. That wall is slated to infiltrate the seven acres of green space surrounding Loretto Academy, the stately, 148-year-old convent school that sits atop the bluff at the Horseshoe Falls, and from where Bess Heath, in The Day the Falls Stood Still, glimpses prayers drifting heavenward in the mist above the falls. Loretto was sold to a hotelier, who plans to replace the treed grounds of the property that today frame the falls in nature with three towering buildings, one a whopping 57-storeys, more than three times the height of the falls. The idea of high-rises forming the backdrop to a natural wonder of the world does not sit well with me. The sanctity of the place, I feel, must be preserved. I’ve become a founding member of conservation organization Friends of Niagara Falls. Our first task: stopping the high-rise development planned for the grounds of Loretto Academy. Thank you for stopping by today, Cathy. The Day the Falls Stood Still is available at bookstores everywhere. Photo credits: Cover art for both the hardback and paperback versions of the novel were taken from the author's website. 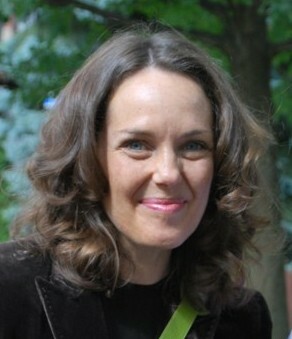 Author photograph taken by Marion Roes. 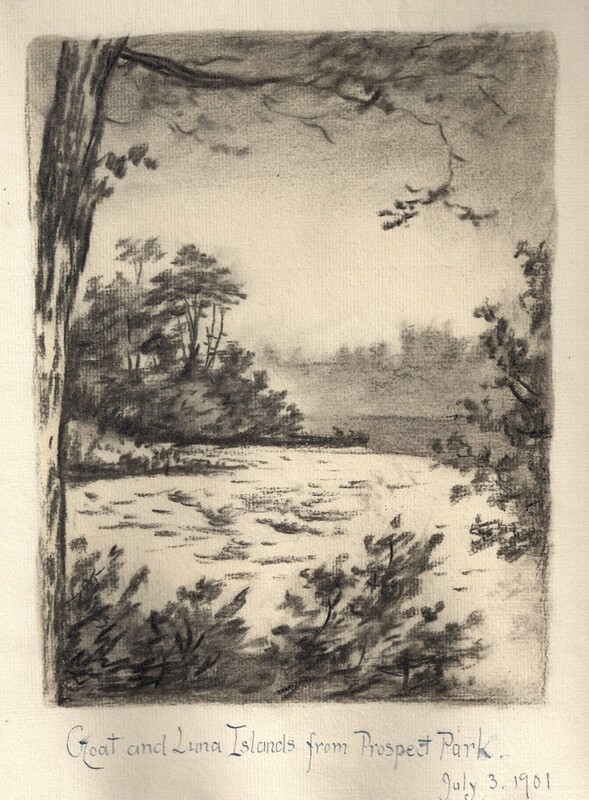 Niagara sketches were done in 1900-01 by Katie C. Niles, my great aunt. I own the originals. Your interview with Cathy was excellent ! Excellent, very interesting. I admire people with imagination and writing abilities. Thanks for stopping by, Marion and Elsie. Talk about perfect timing. I just finished reading The Days the Falls Stood Still. Yes, truly "mesmerizing". I ached for Tom and Bess, too. I also fell in love with Tom and the falls he cherished. This engaging interview adds meaningful layers to all I love about the book, including Tom's passion for preserving the falls and his spiritual connection to his grandfather,Bess and Tom's relationships with their sons, and Bess's ability as a seamstress. I knew you'd love it, Mom. You two make the book sound intriguing! Kim, the questions you asked Cathy, reminded me of a small, but valuable little book, written by Phyllis Whitney,entitled,"Guide to Fiction Writing". It outlines her plan for writing her over 60 novels "that sold millions of copies of her books". She died Feb. 8, 2008 at 104 years of age. Port Elgin, Ontario, author Marylynn Williamson, who writes under the names of Susanna Kearsley and Emma Cole, uses her plan and advice successfuly. She followed her advice and won the Catherine Cookson Award for Literature in 1995 for her first book, "Marianna". Now, she travels to a different country each time she writes a novel and takes the expenses off her income tax. I paid $100.00 to take her Marylynn's course only to discover when I got home, I had all the course's information and more, in my bookcase at home in the form of Phyllis Whitney's 133 page book, which I paid peanutse for! I am sure you could pick it up very inexpensively on ABE Books or one of those internet bookstores. It will answer all your questions and then some. I highly recommend it to you and your other writer-friends! Whose head is this anyway?